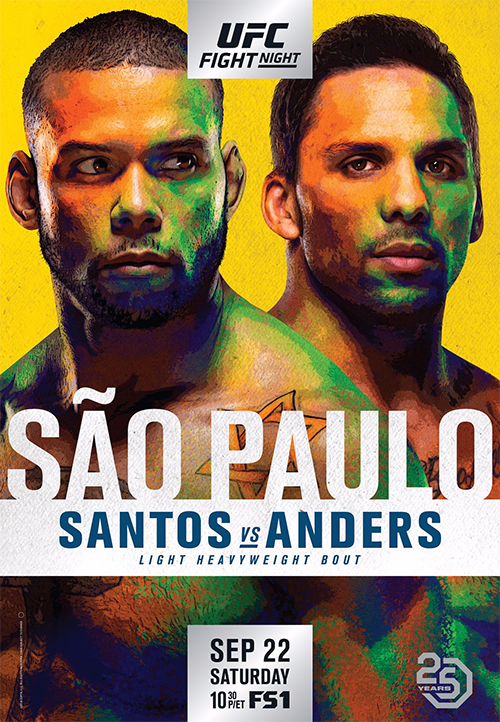 UFC Fight Night 137: Santos vs. Anders is an upcoming mixed martial arts event produced by the Ultimate Fighting Championship that will be held on September 22, 2018 at Ginásio do Ibirapuera in São Paulo, Brazil. Welterweight Alex Oliveira vs. Carlo Pedersoli Jr.
A light heavyweight bout between former UFC Light Heavyweight Championship challenger Glover Teixeira and Jimi Manuwa was expected to serve as the event headliner. However, Teixeira pulled out on August 14 due to a shoulder injury. He was replaced by Thiago Santos. Manuwa pulled out of the bout on September 16, due to undisclosed injury. He was replaced by Eryk Anders. Mark Godbeer was briefly scheduled to face Luis Henrique at the event. However, Godbeer pulled out of the fight in early August citing injury and was replaced by promotional newcomer Ryan Spann. Neil Magny was scheduled to face Alex Oliveira at the event. However Magny was removed from the pairing on August 22 in favor of a matchup with Santiago Ponzinibbio in November at UFC Fight Night 140. 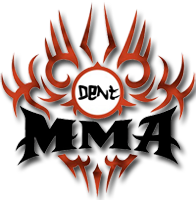 He was replaced by Carlo Pedersoli Jr.
Ketlen Vieira was expected to face former Invicta FC Bantamweight Champion and UFC Women's Featherweight Championship challenger Tonya Evinger at the event. However on August 7, Vieira pulled out due to a knee injury. Evinger was removed from the card and then rescheduled for a future event against a different opponent. The Ultimate Fighter: Nations middleweight winner Elias Theodorou was expected to face The Ultimate Fighter: Brazil 3 heavyweight winner Antônio Carlos Júnior at the event. However, Júnior pulled out on August 28 due to injury. The pairing was left intact and rescheduled for UFC 231. Elizeu Zaleski dos Santos was expected to face Belal Muhammad at the event; however, it was reported on September 14, 2018 that the bout between the pair was scrapped and Muhammad was replaced by newcomer Luigi Vendramini. Looking good my man. Should be a good night of fights. I always love a Smiling Sam Alvey fight. Such a great guy. You cant help buy love the guy, and the fact that he usually knocks people clean out. That also helps, all while doing it with a huge smile. At the weigh-ins, former UFC Bantamweight Champion Renan Barão weighed in at 141.6 pounds, 5 pounds over the bantamweight non-title fight limit of 136. Barão was fined 30 percent of his purse, which went to his opponent Andre Ewell. What a fight between Santos and Anders. Crazy Anders could't get back to his stool in-between rounds. That was nuts. I was happy Santos won though. First Main event in a while where the person I wanted to win won. Now if Conor can only bang Kabob's head into the ground. I'll be a happy guy. Yeah it was a cool event with a lot of good fights. Great to see Brazilians win in Brazil Santos is a real sledgehammer as his nickname so correctly says. BANG BANG BANG lol. Quite different but enjoyable with Fitzgerald and Smith as commentators. They go well together. I like how UFC are mixing it up lately. Yeah, Santos is the man. One of my Fave UFC fighters actually. Was super excited to see him get his own Main Event, especially in his hometown. And to defeat someone like Anders at that, who I felt has been a bit of a bully in the Octagon and honestly needed a loss to show him it happens. The commentating was ehhh, okay. I think they are getting there, but are they anywhere close to like a Hardy and Rogan, No. As they were still stumbling to get the moves called out, and talking over each other, etc etc. Where with the big events, and you have DC, Rogan, and Hardy commentating. They are calling out moves right as they land, before they are thrown, as they are fighters through and through, and can see the set ups for those moves. I just think it will take time for Smith and Fitzgerald to get to that point. But, that being said, they absolutely will, as it was honestly funny to listen to them stumble and keep apologizing to each other for finishing each others sentences. And good lord am I excited for October in General. I have multiple large scale concerts to go too to shoot photography for, I have the "biggest UFC ever" to watch, and so much more. Gonna be a good month. This obviously contains SPOILERS so only click if you have watched the event! FIGHTTRAX and the FIGHTTRAX logo are trademarks of Twentieth Century Fox Film Corporation. Patent Pending.